On Saturday morning I confronted my ResultsManager Daily Actions Plus dashboards in MindManager facing several dozens items in my @web, @home, @errand, @workpc context lists. The problem was I had the flexibility to be in almost any of these contexts at that moment. The GTD approach in this situation is to fall back to (2) time available, (3) energy available, and (4) priority in order to make choices “in the moment”. I would add “area of focus” to that list as the “soft context” of a situation (Saturday morning), needs to somehow trump the ready availability of @workpc. 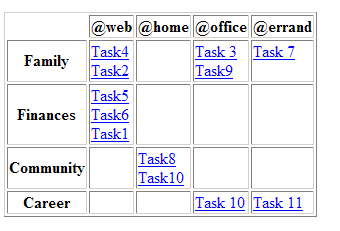 What I was missing was the ability to easily see my task and project lists in multiple dimensions at once. Custom ResultsManager dashboards like Next Actions by Context and the Review dashboard can slice things up by Area and context, Priority and Area, etc. The problem is that if you have let your lists grow too “hot”, they can be hard to review or print when fully expanded. Over time an additional “cringe factor” can develop that makes you inclined to avoid expanding certain branches. So what did I do? — I guess I ended up in @blog and wrote a macro (map2table.mmbas) to export a 3 layer map branch (or map) to an html file. My focus in writing this was on ResultsManager dashboards, but it will work for any MindManager map where the structure translates well to a table (e.g. a pro vs. con list for a set of options). The simple example below illustrates how it works. You start by selecting the parent of a 3 layer deep branch (“Next Actions” in this case). The hyperlinks on third layer entries are retained. In the case of dashboards, these are back to underlying maps, but could be to external websites or linked maps if used with a conventional map. I found this new viewpoint very useful. 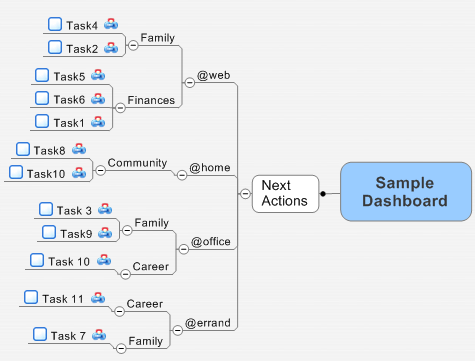 I began by running it on the “Next Actions” branch of the Daily Actions Plus dashboard to get a view of my next-actions by area and context. It immediately identified actions that were not associated with one of these dimensions. Context-free actions have a tendency to be “blobs”. I next went to several review dashboards to look at projects by area and priority as well as area vs. committed status and variations on these two themes. As an example I’ve uploaded a “Project Summary Template” and Area and context dashboard templates. I found making use of this macro and viewing things in concise tables led to one of the more effective review sessions I’ve had in awhile. It was particularly helpful to see the relative sizes of my committed and someday projects lists by area and moving projects back and forth. Again this was nothing I couldn’t do in a dashboard map, but the change in perspective was liberating. The hyperlinks in the table make it easy to jump back into underlying maps to update and adapt maps.